Because Islam is a threat – a most emphatically serious threat. The future, as Steyn brilliantly shows throughout his book, belongs to the fecund and confident. Islam is both, while the West is looking ever more like the ruins of civilization. Someday soon, you might very well be awakened by the call to prayer from a muezzin. People in Europe already are. And liberals will continue to tell you that “diversity is our strength” – while enforcers from the Taliban cruise Greenwich Village, burning books and barber shops; and the Supreme Court decides that sharia law doesn’t really violate the “separation of church and state”; and the Hollywood Left decides to stop pursuing “gay rights” in favor of the much safer charms of polygamy. If you don’t think that can happen… think again. You haven’t been paying attention. Throughout the course of his book, Mark Steyn addresses this Islamic threat and challenges readers to take it seriously. In fact, he manages to cover quite a bit of ground in just a few hundred pages. The key factors which he deals with, however, are 1) demographic decline, 2) the unsustainability of the advanced Western social-democratic state, and 3) civilizational exhaustion. And he does it all with confidence, wit, and a liberal dose of humor. Bomb us, and we agonize over the ‘root causes’. Decapitate us, and our politicians rush to the nearest mosque to declare that ‘Islam is a religion of peace’. Issue blood-curdling calls at Friday prayers to kill all the Jews and infidels, and we fret that it may cause a backlash against Muslims. Behead sodomites and mutilate female genitalia, and gay groups and feminist groups can’t wait to march alongside you denouncing Bush and Blair. Murder a schoolful of children, and our scholars explain that to the ‘vast majority’ of Muslims ‘jihad’ is a harmless concept meaning ‘healthy-lifestyle lo-fat granola bar’. Thus the lopsided valse macabre of our times: the more Islamists step on our toes, the more we waltz them gaily around the room. 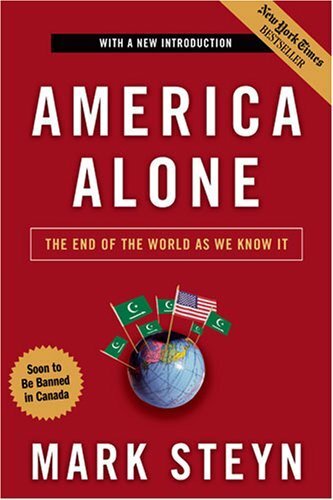 Steyn believes that America can survive, prosper, and defend its freedom only if it continues to believe in itself, in the sturdier virtues of self-reliance (not government), in the centrality of the family, and in the conviction that our country really is the world’s last best hope. However, I would add that putting God back where He belongs in our hearts and minds is the real starting step. He is the Beginning and the End, and if He is not put first, all other measures, however good in and of themselves, will fail. As Christians, we must also remember that God is wholly sovereign. Nothing is outside of His control. As the Heidelberg Catechism puts it, “… all creatures are so in His hand that without His will they cannot so much as move.” We are to live and look at the world in light of this fact. However, this does not mean that we are to turn a blind eye to the danger around us. We are to be watchful and aware. And reading this book will help you be more fully conscious of the threat that Islam poses. I will add that this book is not for readers under 16. The themes that Steyn deals with are very mature, and there is some strong and crude language scattered throughout. If you’re looking for something to read on current events, then definitely pick this one. It’s laugh-out-loud funny while simultaneously giving you a sobering new look at the world around you. While I can sympathize with some of the concerns that Steyn points to, I still would like to point out that for individual Christians, by subscribing publicly to “the muslims are out to get us” panic mentality that writers like Steyn and Bill Bennett represent, and by making that our message, we run the risk of pushing away individual muslims who need the gospel of Christ of which we are stewards. As believers in Christ, our public role, regardless of our personal opinions about the true nature of Islam and what its agenda may be, is to represent the gospel and speak the gospel. By passing around books like this one, I’m afraid we may be encouraging a polarization in the relationship between individual muslims and committed followers of Jesus. Jesus or Paul could have said many truthful things about the evils of emperor worship or the mystery religions of their day, but instead they lived as heralds of the truth, knowing that the gospel offers the only real antidote to the destruction that all false religion inevitably leads to. I think there is a place for understanding the true nature of Islam and the radicalization that it leads to. Such an understanding may lead one to certain political choices when those are necessary (such as when we vote, or if we are elected officials, what policy we support). But I also think the individual follower of Christ has to be very careful not to try to bring change through political means. Exposing the “agenda” of islam publicly has to be done in such a way as not to compromise the Christian’s primary role as an ambassador of Christ bearing the good news of his death and resurrection. I guess I’m not so much disagreeing with anything in your review, just voicing concerns about the type of pointed, caustic criticism that Steyn’s book represents. I certainly agree that we, as Christians, should be reaching out to unbelievers, Muslims included. There is a balance, however. Jesus commands me to love my enemies and to share the gospel with them; he also says, “Behold, I am sending you out as sheep in the midst of wolves, so be wise as serpents and innocent as doves.” (Matthew 10:16). Steyn’s focus in this book was not to target individual Muslims, but Islam as a whole. Not all Muslims go around with explosives strapped to their chests or condone terrorism, and Steyn readily acknowledges that. That said, radical, fundamental Islam (i.e. true Islam) really is “out to get us”, as you put it. Steyn is not a Christian as far as I can tell, but neither do I think his purpose is to spread mass panic; he’s just trying to open people’s eyes to the fact that Islam is a clear and present danger, not a “religion of peace”. And really, I’m not saying that people should read this book and then go have some sort of political revolution and wage war on the Muslims. I’m just saying people should read this book and be made aware. If anything, reading America Alone sharpened my recognition of the necessity of fervent prayer and witnessing to the lost. I do agree that radical Islam is a threat to peace, but I think that the way this book presents it (from how you review it), will be doing more harm than good. A harsh word makes people more stubborn, while a kind word has the opposite effect. Just like the folk tale of the Sun vs the Wind. To quote the sentect “vast majority’ of Muslims ‘jihad’ is a harmless concept meaning ‘healthy-lifestyle lo-fat granola bar’” alone disturbs me, because the outright mocking makes us seem immature and childish. But do you know any book, where the author has read and compared the Koran and the Bible side by side and compared the two? I think that would be the most effective way, rather than outright criticism. My concern is just that the primary way I see many evangelicals relating to muslims and talking about muslims echoes more Steyn than it does a Biblically informed understanding of what our role is with regard to those of other religions. I recently preached in a church where an Iranian man and his wife who had been in the U.S for less than 6 weeks were in attendance. I didn’t pull any punches. As a missionary speaker, I shared that muslims, just like many so-called Christians in the Bible belt are in spiritual darkness. Two weeks later he and his wife gave their life to Christ because of a church that saw their presence as an opportunity, not a threat. Again, Corey, I’m not trying to equate you with Steyn, just saying that these are perspectives on the muslim presence in the U.S. that I would like to hear more from Christians. @Euastacia: I think there’s been a misunderstanding here about the nature of that quote I shared. Those words were aimed, not at Muslims, but at the people who want to sugercoat Islam and deny that it is – at it’s very core – a religion of hate. Also, there is a place for mockery/satire/ridicule. Sharp-edged humor can be used to expose folly and vice in a very clear and unforgettable way. One notable biblical example is when Elijah used it against the prohpets of Baal (I kings 18:25-27). In the case of America Alone, Steyn uses it against political-correctness. However, I would say that the antidote for such a mentality is not to altogether avoid reading America Alone. It’s a very helpful and eye-opening book. I think the trouble occurs when undiscerning, Word-deficient Christians read this book and warp it and use it as a justification for panic and hate. The trouble, therefore, lies not with the book, but with the people who read it. Agreed, Corey. Point well-taken. Thanks for taking the time to read the book and write this useful review for us. Have you read “The Fight of our Lives” by Bill Bennett? 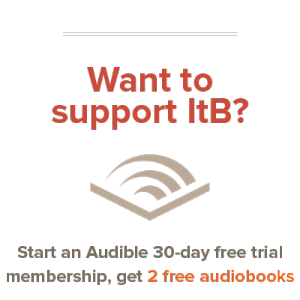 Andrew has written a review on it for ITB. @Mr. Jay: You’re more than welcome. I love reading and writing – what better combination of the two than a book review? 🙂 I have not read “The Fight of Our Lives”, but it sure sounds like a good read. I’ll have to check it out.